Can Big Data Help Farmers Use Less Water? Researchers installing a networked soil moisture sensor at the University of Georgia's Stripling Irrigation Research Park in Camilla, Georgia. Georgia’s multi-billion dollar agriculture industry needs water, but farmers who rely on the Flint River could soon face drastic water restrictions. Right now, Florida is suing Georgia in the U.S. Supreme Court. The case is just one part of Georgia’s decades-long three-way water war with Alabama and Florida. The outcome won’t mean an end to the water fight, but it could result in a cap on how much water farmers in southwest Georgia can pull from the Flint. In the meantime, farmers are looking for new ways to use less water, and some are turning to big data to find solutions. The Cox family has been farming along the Flint in Camilla for six generations. As of late, there’s a new position on their management team. She’s next in line to take over her family’s farm and grow peanuts, soybeans, and sweet corn on 2,400 acres dotted with strands of longleaf pines. But she’ll only be able to contribute to Georgia’s multi-billion dollar agriculture industry if she has water. 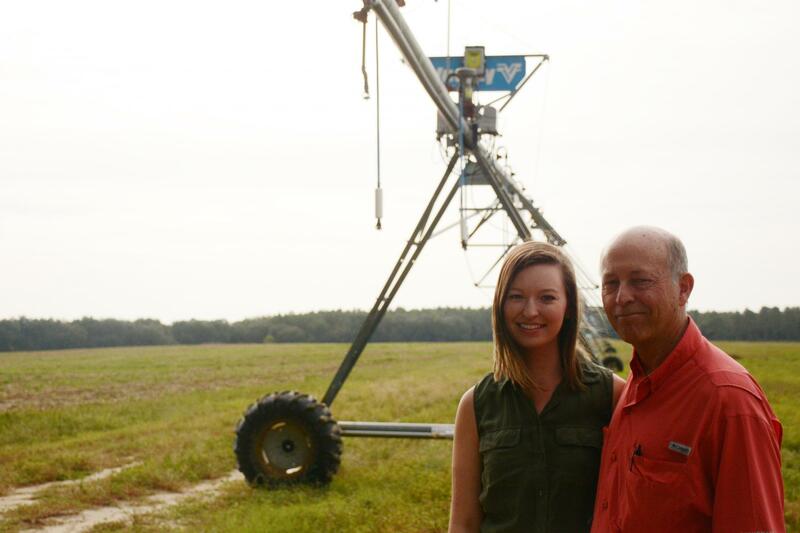 Casey Cox and her father, Glenn, showing off one of their center-pivot irrigators equipped with a water-saving variable rate irrigation system. The center-pivot irrigation system that stretches from the center of one of the Cox’s 100-acre fields looks lithe despite its size. Though it hulks high and heavy above the gently sloping ground, the flip of a switch would send it rotating steadily around its axis. The Cox family has nine such irrigation systems that distribute water from seven wells tapped into the Floridan Aquifer, the groundwater source that helps feed the lower Flint River. Their irrigators are already efficient thanks to variable rate irrigation, a technology that lets farmers apply different amounts of water to different parts of their fields. Cox said it makes a big difference in areas where no crops are planted. And since running the irrigators’ wells uses a lot of electricity, pumping less water saves the farm money. But irrigation is getting even more advanced. As we talked, Cox grabbed her smartphone and opened an app that’s linked to a soil moisture monitor. “And we can pull up this app, look at the soil moisture level in the field, decide whether we need to irrigate or not, and then I can go to the next part of the app and cut the system on or off,” she explained. That kind of from-the-field feedback plays a key role in helping farmers conserve water. “You’re making a change, and then you’re seeing if that change had the effect. It’s a closed loop. You keep monitoring and making a change,” said Calvin Perry, who runs the University of Georgia’s Stripling Irrigation Research Park. (Left) Calvin Perry inspecting a drop nozzle on an irrigation system. Since it delivers water closer to the crop, it saves water. (Right) Perry pointing out different kinds of soil moisture monitors. The facility, right down the road from the Cox’s farm, hosts engineers working to make irrigation systems smarter. George Vellidis, a crop and soil scientist at UGA, believes better data is the key to making farmers more efficient with water. On a recent afternoon, Vellidis stood in one of Stripling’s research plots with a colleague from Japan, scoping out a good place to bury a prototype soil moisture monitor. Those models will eventually drive apps that use information from those sensors to give farmers watering recommendations in real time. The idea is to take the guesswork and waste out of irrigation. “We convert this information, which is raw data on soil moisture, into actionable irrigation amounts,” Vellidis said. (Left) George Vellidis and Ryo Shigeta hunting for the best spot to bury a prototype soil moisture sensor. (Right) The sensor planted among a row of cabbage. An initial test showed the system could cut a farmer’s water use in half, and Vellidis was confident a second test would produce similar results. That kind of efficiency applied to the thousands of irrigators in the Flint River basin could have a major positive impact. But Gil Rogers with the Southern Environmental Law Center worries efficiency gains won’t be enough to solve the state’s water problems. “Farm permits for water withdrawal are very permissive in Georgia. It’s basically a rubber stamp,” he explained from his office in Atlanta. Rogers said Georgia’s water laws were written that way to encourage the growth of the state’s agriculture industry. “I think the problem now is that it’s become too much of a good thing, and you’ve got more permits issued than there is water in a lot of cases,” he said. Locations of agricultural water withdrawal permits and applications for groundwater (blue) and surface water (green) as of fall 2008. Case in point: Georgia issued a moratorium on drilling new agricultural wells into the Floridan Aquifer in 2012. That moratorium is still in place today. While he applauded farmers working to become better water users, Rogers said change needs to come from the state level in the form of more sustainable water laws. He predicted a decision in the pending Supreme Court case--either a water usage cap or some other measure--could finally encourage action from Georgia lawmakers. But farmer Casey Cox isn’t waiting for outside forces to convince (or compel) her to think about saving water. On her farm in Camilla, she walked through a stand of moss-draped longleaf pines toward the murmur of the Flint River. 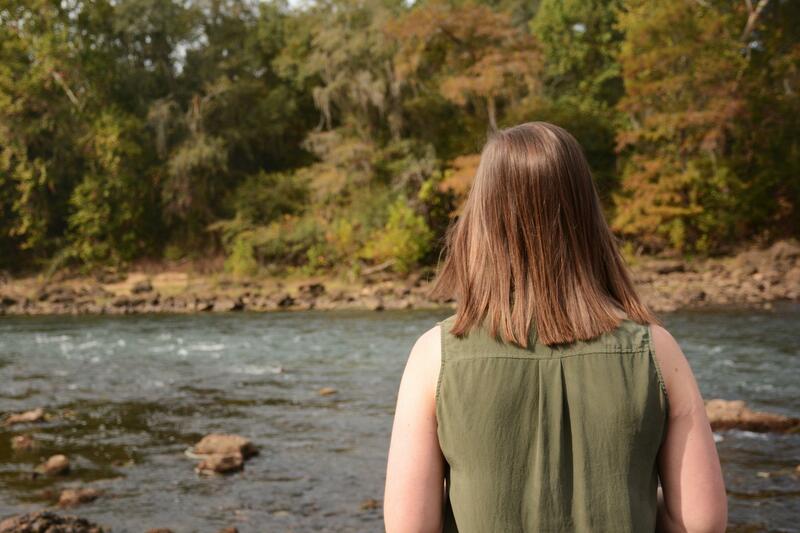 Casey Cox looking out over the Flint River and the water that's the key to her future as a farmer. Cox climbed on a boulder at the water’s edge, surveyed the quick-flowing river lined with trees just turning their autumn colors, and took out her smartphone for a few pictures. “We depend on this for everything, so we have absolutely every incentive to take care of it,” she said. For Cox, being smart with water now isn’t about possible future usage caps. It’s really not even about saving money. Conservation is an insurance policy for her future.